Kwame Alexander has written eight books, owned several publishing companies, written for stage and television, recorded a CD, performed around the world, produced jazz and book festivals, hosted a weekly radio show, worked for the U.S. government, and taught high school. Founder of the annual Capital Bookfest, he has a passion for helping young people discover the pleasure of reading and writing poetry. Kwame lives in the Washington, D.C. area with his wife and daughter. 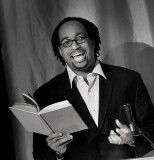 Learn more about him at http://kwamealexander.com/.